Here we have a side chair that breaks the mold and is suited to the client that wants that unique ” Retro ” look. 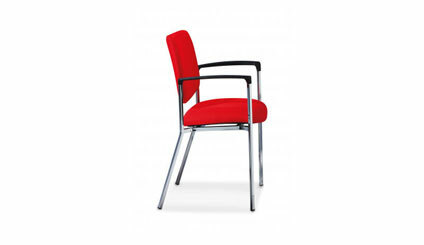 This can be used in a waiting room, side chairs, meeting rooms and just about anywhere seating is required. This can also enhance the comfort of your home office. The Twist side and task chair comes with a sculpted metal frame. You can either have it fully upholstered or with a wood back which is available in 3 stains, clear maple , cherry and walnut. You can pick from a broad range of fabric finish selections. The “Twist” side chair has a matching multi purpose collaborative chair that has a swivel tilt mechanism and offers straight forward adjustability and straight up comfort and value for a very affordable price. I use this chair for the client who has seating requirements that are not overly task intensive and on a budget.